“The Thin Blue Line” is the fascinating, controversial true story of the arrest and conviction of Randall Adams for the murder of a Dallas policeman in 1976. Billed as “the first movie mystery to actually solve a murder,” the film is credited with overturning the conviction of Randall Dale Adams for the murder of Dallas police officer Robert Wood, a crime for which Adams was sentenced to death. With its use of expressionistic reenactments, interview material and music by Philip Glass, it pioneered a new kind of non-fiction filmmaking. Its style has been copied in countless reality-based television programs and feature films. 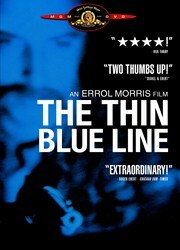 “The Thin Blue Line” was voted the best film of 1988 in a Washington Post survey of 250 film critics. Premiere magazine, in a survey of films of the 1980s, described it as one of the most important and influential movies of the decade.